No Mennonite celebration-Sunday dinner, a wedding or one of the familiar feast of Christmas, Easter or Pentecost- was complete with out some form of Mooss. Either with a clear or cream base. It was served with Ham (schienktje fleisch), fried potatoes (jebrodne aetchocke). 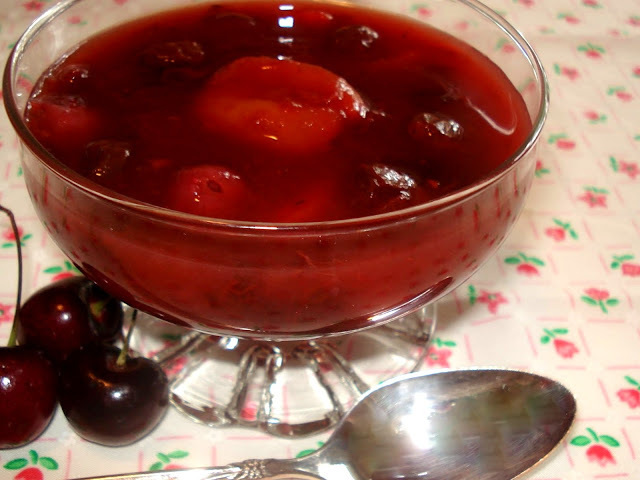 This fruit soup was served cold for lunch on Sunday's so that the women would not have to cook on the Lord's Day. The following are two recipes that my mother still makes today. Put water in large pot. Add dry fruit (apples, apricots, pears, prunes, cherries, raisins) any mixture will do. Bring to a boil, simmer til done about 15-20 minutes. Meanwhile combine jello, sugar and cornstarch. Add to the fruit and cook additional 3-4 minutes to cook cornstarch. Cool. Store in refrigerator. Will last for weeks. Great for the summer. Tastes very good over ice cream or cold vanilla pudding. This is a wonderfully tart, refreshing Mooss with a delicate flavor. Kjressbaar lovers will enjoy this treat. In a saucepan bring gooseberries and water to a boil. Stir a thin paste of the sugar, flour and part of the cream. Add slowly to the gooseberry mixture, alternating with the remaining milk and cream. Stir constantly. Remove from heat. Cool. May be served warm or cold. variation: A Canadian version would be to add an egg to the thickening after the berries have been boiled to make it more custard like. Add a little hot fruit to the flour/sugar/cream and/egg mixture. Stir well. Then return egg mixture to the gooseberries. Stir constantly. Boil 2 minutes, 1 teaspoon vanilla is optional. Cool, Enjoy! I enjoy the Moos made with water as its fluid base, but I also love the Moos made with milk as its fluid base. Do any of you have a recipe for Milk Moos with fruit (my mom always used canned Bing Cherries) can't seem to find the canned cherries in Superstore where I used to buy it. If you look under Mennonite Recipes in our index file you will find a few written recipes that use a milk base for moos, I am sure you can adapt one of those to use with canned cherries, I hope you enjoy them. I just realized that at the end of this recipe there is a milk base with gooseberries, try using that recipe substituting cherries for the gooseberries but add less sugar as the cherries are less sweet than the gooseberries. Hey Charlotte. .I just bought the fruit to make plumi moos and so when it is finished I'll post a picture on for you. . we love plumi moos (that is what we called it. . but i suppose there were more than just plums in it) when it is done. I make mine exactly like yours. Now. .the gooseberry moos, I don't think I ever tried. I know my mom made it but I must have been hiding. .oddly. .now my mouth is watering. I'm so delighted you have begun. I grew up on all these favorite recipes. My mom made both plumi and gooseberry moos as we had them in abundance. I am making this weekend the plumi moos and can't wait to eat it. It is a reminder of my Mennonite background and upbringing. New Years cookies(fritters) are a must..
now. .I'm really laughing. .Annelise. you can go ahead and put up your picture if you can figure out how to do that. . I'm sure you can. oh my oh my...gooseberries. Wow...and yum! Plumi Mooss. That is what I grew up on...did I spell that right? I guess that is basically the same thing. Something I can not get my East African husband to eat yet! Ha...but yes, for faspa we would eat that. Still yearn for that from time to time...maybe I will make a 'small' batch for just me! do show your picture anneliese, since i don't have one....this is too funny! lovella post your too, the more the better! Yummy I love 'moos' of any kind, today I made sorrel moos, anyone familiar with that? When I make plumi moos I also put tapioca in it. My mother by love cooked it like that. Now my family wants it only that way. Thanks Charlotte for the recipes! not so hard to post after all..
bettyr post your surromp mooss, i love that stuff. my mom still makes it. The cherry jello is what makes it fabulous. Mom always added home canned white and purple cherries too. SO good. My wonderful mother-in-law used to make a Birnen Moos. (Pear Moos) It was basically chunks of canned pears in a custard sauce thinned with milk. Absolutely yummy. My mom makes plumma (plumi?) moos and cherry moos at Christmas and I love them both, so, like the good mom she is, she always sends me home with a couple quart jars of each. My husband doesn't care for it, so it takes me a while to get through it myself. Last year I horrified mom by conducting an experiment to see just how long the moos will last in the fridge. Stored properly, I found the plumma moos will last at least 6 months (that's how long it took me to eat it all). I'm sure that violates all sorts of general food safety rules, but that's my unscientific conclusion. My dad says grandma would make big batches of it to store in a crock in the basement. That lasted a long time, he said, but with six boys and assorted hired men, I find that hard to believe. The gooseberry moos looks great. Thankyou Thankyou Thankyou . My mom passed away a number of years ago, and with her, all those wonderful Mennonite recipes I was raised on......or so I thought until I came across this website. I cant tell you how excited I am to have found this site. Thank you again.......right down to the plumi moos recipe I had so longed for. I just came back from St. Jacobs in Ontario, and no one seemed to know of this cold fruit soup. Thankyou again. Bill Neufeld Oh, and ps.......Mom also made chokecherry (sour cherry)mooss ... milk based. It was my favorite. I was so happy to find this recipe! I haven't had pluma mooss for years!! (Sorry I don't know how to spell any low german words :( My parents never taught me) This recipe is a lot like my moms. I think she uses Strawberry Jello, and we always used fresh fruit. Usually waited til the BC fruit truck came to Friendly Manitoba, and then used that. I've got a horrible craving now!!!! I'm smiling reading all the comments about not being able to cook without a recipe. Part of my Menonite heritage was not having a recipe until the Mennonite Treasury was printed in 1962 and by then I had learned to cook. So when I went off to my first job miles away from home Mom sent the book with me as I had broken the tradition of just being around the corner from her or Grandma who had committed recipes to memory from cooking. Either Moos of some kind or rice boiled in milk, sometimes with raisins added and then sprinkled with sugar and cinnamon as you dished up was on the menu every Sunday dinner. Add buns or bread and ham or farmer sausage to complete the meal. This reminds me of gatherings at my grandparents house. I remember my grandma always moos with sasktoons because they were my favorite berry. I'm going to try this recipe pronto!! I remember both my grandmothers making Pluma Moos and Cherry Moos. Loved both and occasionally I still make them. I guess you had to grow up with it, since my husband isn't as thrilled with it. Stumbled on this and it instantly made me think of my Oma. She made the best Kjressbaer/Gooseberry Moos ever! My sister has a bush and I can't wait for summer to make some. It was my most favorite food my Oma made. My dad talked about Pluma Moos but I had no idea what he was talking about. My Norwegian mother would make what she calls Fruit Soup every Christmas but my Mennonite dad would call it Pluma Moos. Either way-very good and will try it! What is a Mennonite Recipe Blog?